Neil Reimer and Donnie Block were friends at the University of Texas. 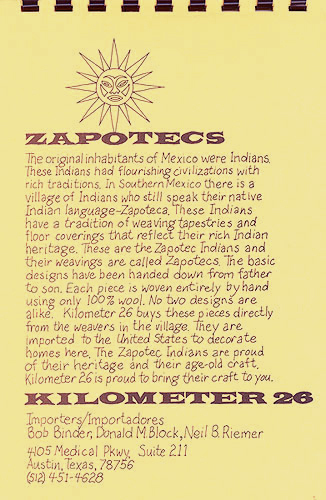 One of their Kilometer 26 ventures was to travel to Mexico and buy hand-made woven rugs, bring them back to Texas, and sell them. They asked me to help create a catalog that could be changed easily as they bought new patterns and that would not cost very much. 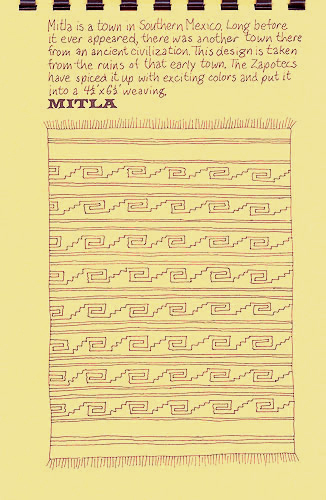 Some of the limitations were that the colors of the specific patterns would change with each shipment they brought back, it had to be easy to add or delete pages, and it had to be produced quite inexpensively. 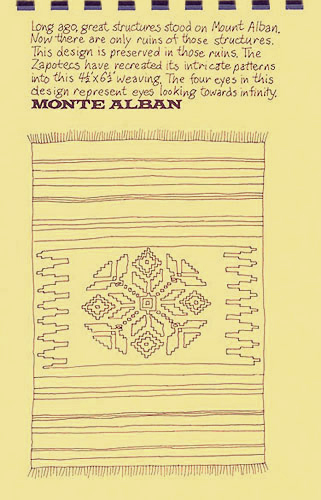 The concept was dictated by the hand-rendered quality - so the illustrations would be hand rendered freehand, with no mechanical straightedge or drafting tools and the text describing each style would also be handwritten since the rugs are handmade products selected for their unique quality. 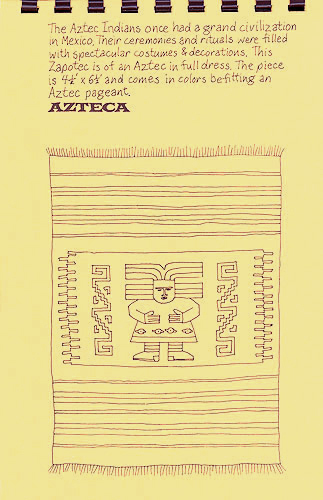 The images are simple line drawings to convey the pattern and style for each rug. Since every one is a different color, showing a color photo might be misleading to the buyer. The paper was a natural cream color with a simple and inexpensive plastic binding along the top edge. This binding allowed the guys to add and delete pages as necessary. That is also why there are no page numbers.